The lattice thermal expansion and conductivity in bulk Mo and W-based transition metal dichalcogenides are investigated by means of density functional and Boltzmann transport theory calculations. 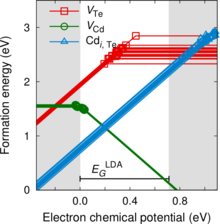 To this end, a recent van der Waals density functional (vdW-DF-CX) is employed, which is shown to yield excellent agreement with reference data for the structural parameters. The calculated in-plane thermal conductivity compares well with experimental room-temperature values, when phonon-phonon and isotopic scattering are included. To explain the behavior over the entire available temperature range one must, however, include additional (temperature independent) scattering mechanisms that limit the mean free path. Generally, the primary heat carrying modes have mean free paths of 1 µm or more, which makes these materials very susceptible to structural defects. The conductivity of Mo- and W-based transition metal dichalcogenides is primarily determined by the chalcogenide species and increases in the order Te-Se-S. 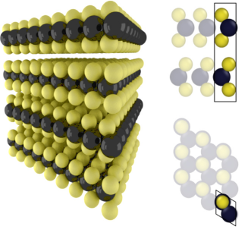 While for the tellurides and selenides the transition metal element has a negligible effect, the conductivity of WS2 is notably higher than for MoS2, which may be traced to the much larger phonon band gap of the former. 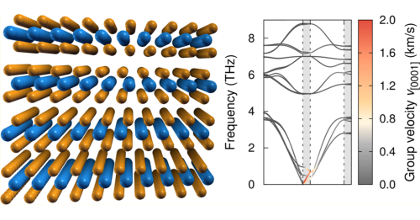 Overall, the present study provides a consistent set of thermal conductivities that reveal chemical trends and constitute the basis for future investigations of van der Waals solids.